The best evidence to date shows a significant association between thyroid autoimmunity and depression & anxiety. But what does this mean and what should you do about it? Let’s discuss the bottom line regarding the best diets and natural treatment options for improving thyroid autoimmunity and mood. Dr. Michael Ruscio, DC: Hi, this is Dr Ruscio, and let’s discuss the association between thyroid autoimmunity, and anxiety and depression. Now what is thyroid autoimmunity? Thyroid autoimmunity is an immune condition in which your immune cells attack your thyroid gland, which they shouldn’t, and this can cause progressive damage to the gland which can then lead to hypothyroid. It is the most common cause of hypothyroidism. Association of Depression and Anxiety Disorders With Autoimmune Thyroiditis: A Systematic Review and Meta-analysis. Patients with AIT exhibit an increased chance of developing symptoms of depression and anxiety or of receiving a diagnosis of depression and anxiety disorders. Be very cautious with the functional (or natural) medicine advice you take. Get help with thyroid autoimmunity. DrMR: I’ll quote here their conclusion. 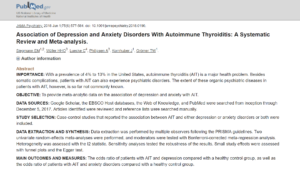 “This meta-analysis establishes the association between AIT, autoimmune thyroid, and depression and anxiety disorders. Patients with AIT exhibit an increased chance of developing symptoms of depression and anxiety, or receiving a diagnosis of depression and anxiety disorders.” Okay, so clearly there is an association between thyroid autoimmunity, being overtly hypothyroid, or subclinical hypothyroid and anxiety and depression. So the question is what can you do? Well, the first thing I would do is be very cautious with, unfortunately, with the advice that you take from alternative natural and functional medicine. The reason for this is because this community, which I include myself in, but I practice this, is very quick to give people very grim diagnoses or prognoses when they’re diagnosed with hypothyroidism, and this is incredibly damaging. When you take someone who has a predilection toward anxiety and depression and you paint their prognosis to be worse than it actually is, you are in effect going to exacerbate their anxiety and depression, and I see this all the time. It’s very upsetting. It’s very disheartening to see people come into the office who think that their condition is far worse than it actually is, and they have this baseline level of anxiety and depression now exacerbated. Because their practitioner, who’s probably operating with virtuous intent but is trying to scare them into motivation, is actually making the situation much, much worse. So you have to be really careful. Unfortunately, and there’s another aspect to this, if I’m being fully candid, which is thyroid disorders are highly marketable disorders. I would first offer you take a big breath in and step back and relax a bit because much of what you are told makes a situation look far worse than it actually is. Yes, they’re an association, but there are plenty of things that you can do to improve your thyroid, and I would argue to also improve your mood. You don’t need to be fear factored into thinking that you can never eat out, have a bite of gluten, or not take handfuls of supplements in order to feel well. Let me run through some of what you can do, outside of being very cautious and circumspect with the advice that you take. A gluten-free or gluten-reduced diet. There’s been one study to date showing a benefit in those without celiac disease. Now the problem here is there’s a number of studies in those with Celiac and thyroid conditions showing improvement when going gluten-free. Yeah, that shouldn’t be surprising. The bigger question is if you don’t have celiac, or you have what’s known as non-celiac, gluten sensitivity, or maybe no celiac-like diagnosis at all, but you have a thyroid condition, and you’re gluten-free, can that improve your condition? One study has assessed that’s shown benefit (subscription required). I think it’s worthwhile to try. I do not think you need to be strictly gluten-free if you have a thyroid problem unless you’ve done an elimination of gluten, you feel better, you reintroduce gluten and you clearly notice you feel worse. If you do, then you have my full support and you should be fairly strict with your application of a gluten-free diet. But if you don’t, this is one of the main pain points where people I think are misled. If you’ve eliminated and then reintroduced and you notice a little to nothing, then eating the gluten-reduced diet is okay. Meaning you can have some gluten from time and time, and I wouldn’t really sweat it. So, that recommendation, gluten avoidance needs to be personalized based upon your response to a gluten reintroduction. 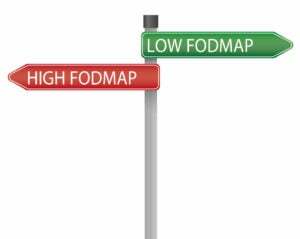 You could also potentially try a low FODMAP diet. Another study has looked at essentially a paleo diet, and I’m painting a bit of an inference into this recommendation. But essentially using a paleo diet, they showed improvements in multiple measures in addition to the thyroid status, and this population seemed to potentially have a FODMAP sensitivity. A few other, well-performed analyses, have shown that those with thyroid autoimmunity and hypothyroidism have a higher tendency to have small intestinal bacterial overgrowth, which may benefit from a low FODMAP diet also. So, two dietary approaches you can try in addition to the basic advice of getting off of processed foods, trans fats, and sugars, and sodas and things like that. Hey, everyone, I’d like to tell you about BIOHM, who helped to make this podcast possible. 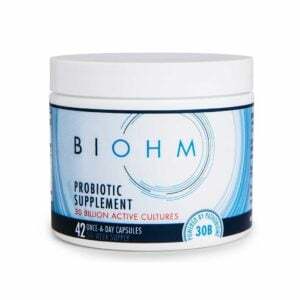 Now, BIOHM offers a line of gut-healing products, including a probiotic, a prebiotic, and a green powder. Now, their probiotic is interesting in the sense that it combines strains from both category 1 and category 2. And if you go over to BIOHMHealth.com/Ruscio and use the code RUSCIO at checkout, you’ll get 15% off your first order. 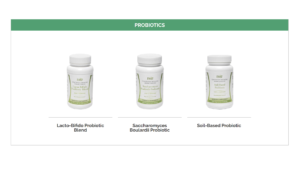 So BIOHM, they’ve got a good line of probiotic and prebiotic and the greens powder, all to help you improve your gut health, which we know has such massive and far-reaching impacts. So check them out over at BIOHMHealth.com/Ruscio. Now there are a few supplements that can be helpful. Vitamin D, there’s been a number of studies showing vitamin D can improve thyroid autoimmunity. Selenium, there’s been a number of studies showing selenium can improve thyroid autoimmunity, but not all studies have shown benefit. Some data has shown that selenium may also improve quality of life, and we can infer from that, that if it’s improving quality of life, people probably have a better mood. So the whole point of the video here is the association between thyroid disorders and mood disorders. So, there’s some evidence that suggests that the use of selenium may help with not only thyroid autoimmunity but with mood. Now, the key point about selenium is you don’t need to use it forever, three to six months if you’re not on thyroid medication. If you’re on thyroid medication, you could make a case for using it for up to a year, and simply track your antibodies, and you’re looking for a significant drop in your antibody levels. Antibodies typically used, known as TPO and you’re looking for a significant drop, but you know, I’d say at least 300 would be what I typically would consider a significant movement, and also your mood to improve. But remember, you don’t have to be on selenium forever. The benefit seems to drop off after three to six months if you’re not on thyroid medication, or about a year if you’re on thyroid medication. 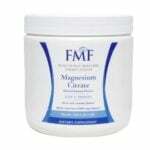 Also, CoQ10 and magnesium have also been shown to help, namely with thyroid autoimmunity. I don’t know that there’s been a tie to mood, certainly, I have no opposition to trying these and seeing how you feel. The other thing that I think alludes a lot of people is improving your gut health, and admittedly I have a gut leaning biased. However, there has now been a number of studies documenting the gut-brain connection, and we reviewed recently a landmark study showing that those with IBS, irritable bowel syndromes: gas, bloating, abdominal pain, altered bowel function, have a higher predilection or a higher prevalence of anxiety and depression. Other data has shown that a treatment for the gut, probiotics can actually help to improve mood. So the gut can be one of these, unfortunately, overlooked pieces of the picture that needs to be addressed. I hope people are not overlooking their gut health, but I see this more often than I’d like to admit where someone gets pulled into a thyroid treatment program because of, let’s say anxiety, fatigue, and depression; all the while the gut has been overlooked. So it’s not to say that the gut is always going to be at the root of the problem, but it’s definitely something to consider because there is this gut-brain connection. Inflammation in the gut, dysfunction in the gut can cause inflammation and dysfunction in the brain, essentially. Then lastly, I would consider, and this is something you need to take on a case by case basis and talk with your doctor, but if you’re on a medication, consider trying a different medication. If you’ve done any research on thyroid, you’ve likely seen something about needing to be on T4 plus T3. I think that recommendation is overstated, but there is evidence to support that. Now, I wouldn’t recommend starting there. Why? Because if you do these other things, and especially improve your gut health, you will improve both the absorption of the medication and the conversion of that medication from T4, the inactive form, to the active form T3. We’ve documented a few case studies now out of our office where patients have felt vastly better, and at the same time, because they’re improving their gut health, been able to decrease their dose of thyroid medication. So, it is possible to take less medication and feel better if you improve what absorbs and helps metabolize that medication, which is your gut. So, switching from a T4 only formulation, like levothyroxine or Synthroid, to a T4/T3 combination like Armor, or Nature-Thyroid or WP Thyroid is something to consider. There’s a little bit more nuance there for people who have chronic non-responsive digestive issues, they may want to consider a trial on a liquid gel tab known as Tirosint, that may also help them. But if you run through some of these steps, you have a very high probability of improving, in my opinion, any thyroid associated anxiety and depression. I think one of the most important things to emphasize is that you don’t need to be scared into a corner where you have to live a highly restrictive dietary lifestyle. A small percentage of people may need to do that, right? 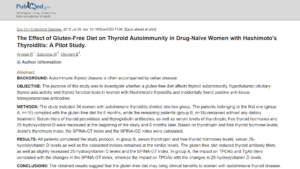 Just quickly here, one Italian study that looked at over 12,000 patients found that there was only about a nine percent incidence of thyroid autoimmunity in those who had non-celiac gluten sensitivity. 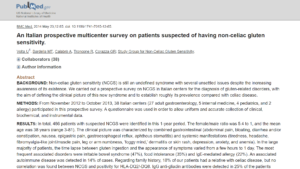 So they took this large group of people who had non-celiac gluten sensitivity … or there’s large of people and they assessed who had non-celiac gluten sensitivity. Of those who had non-celiac gluten sensitivity, only nine percent of them had a thyroid problem. So yes, there’s an association. Yes, it’s documentable. Yes, it’s significant. Does it mean that every person with a thyroid problem needs to be strict, 100 percent gluten-free? No. Why do I say that? Because the fear and anguish that can be associated with living in this stressed out state all the time, because you’re trying to avoid every trace of gluten, can be problematic if you don’t need to do that. Remember to eliminate, and then reintroduce and then consume to your tolerance. Some people need to be very strict, other people have some leeway and it’s important to understand that. Also, to understand that a thyroid condition is not a death sentence, it’s actually a very manageable condition that should respond well to these therapies, plus or minus medication if you need it. You can live a very healthy, happy, productive life, which is important for people with thyroid problems to hear, because you may have a tendency to be more anxious and depressed. So we don’t want to fuel that fire. The truth actually is that you can be very happy, very healthy and very functional. So hopefully this is a lifeline that will pull you out of any despair you can fall into if you’re reading the wrong information on the Internet. So, this is Dr Ruscio with some thoughts on this study; Looking at the connection between thyroid autoimmunity, anxiety, depression. I hope this information helps you get healthy and get back to your life. Thanks. I have all of the above, AIT, SIBO, IBS, anxiety, mood swings etc. I am not sure I gained much from this article other than not stressing out about diet and realizing anxiety/depression can be associated with AIT. I didn’t see anything mentioned in support of those who may have anxiety and/or depression and what they can do about it….what are the next steps for healing? All my health problems began when I was hospitalized for toxic thyroid levels. I was taking meds at the time but taking too high of a dose. That threw me in to all sorts of major health problems including panic attacks and anxiety and that was 18 years ago. I had to take anxiety medications to control the panic attacks and still have to do so.. I also developed many gut issues, parasites, H pylori, hookworm, and SIBO off and on over those 18 years. Before that hospitalization I was eating gluten and a variety of foods with no issues. I had been diagnosed with AIT 10 years prior to that hospitalization. I have sought natural care the past 18 yrs. This year I had another major flareup of SIBO and H pylori all from adding into my diet some resistant starches in order to gain weight. I react to lots of foods and therefore my diet is mostly healthy fats, grass fed or pasture raised meat and eggs and veggies. I do eat some fruit also. I think I would make for a great case study!!! In the article he offers ideas for diet changes to make as well as supplementation. He’s suggesting that improving the health of the gut can have downstream benefits for mental health. 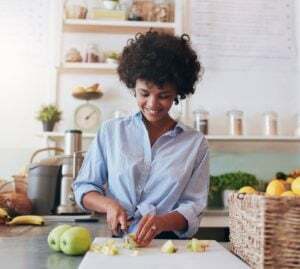 I’d suggest picking up a copy of his book “Healthy Gut, Healthy You” as it walks through a DIY protocol to help overcome stubborn gut issues (including SIBO and h. pylori). You can find it here: https://www.drruscio.com/getgutbook Good luck! I have heard that patient’s with autoimmune hypothyroidism should avoid gluten, not because of celiac disease or even NGCS, but because of a “molecular mimicry” problem with the antibodies. They may be able to tolerate gluten with no obvious reactions at all. As I understand, gluten breaks down to a short chain of amino acids which can resemble thyroid tissue, so when I eat gluten I may be increasing the autoimmune attack on my thyroid tissue and causing more tissue damage? Is this true?? Dr Ruscio has addressed that question in answer to this comment: https://drruscio.com/gluten-sensitivity-association-with-thyroid-autoimmunity/#comment-3946 Hope this helps! I am a Nutritionist and was diagnosed with Hashimoto’s just over 2 years ago. 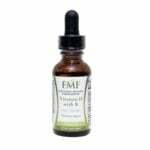 I was already gluten and dairy free following great results from an elimination diet so I have just concentrated on supplements, as you have listed above. Despite all this I had trouble getting my dose of NDT right, still had low temperature 36C and hair loss. Recently felt more tired and yet had insomnia and anxiety but a recent blood test showed I had very low ferritin which I think could account for most of my problems and I have read that it is more common with low Thyroid. Seeing as I am post menopausal it was not something Ihad ever considered. Thanks for sharing! Good luck on your health journey.